After a number of years of high levels of consumer spending, retailers are now facing a period of tough trading conditions. Are you looking for ways to retain customers or their levels of spending? Do you want to know more about your customer base and their spending habits? Do you want to know how shoppers view your brand and your competitors? Do you know how satisfied your customers are with you? Do you want to expand your internet offer? If the answer is yes to any of these questions it is likely that you will be looking to conduct some market research. 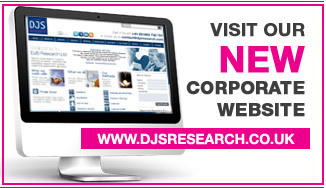 Ali and Danny Sims of DJS Research have nearly 20 years experience in the retail sector. Our experience is made up of projects we have done at DJS Research and when we were at Wirthlin Europe (now HI Europe) and consist of a mix of home shopping and high street market research. High street stores we have worked for include Littlewoods, Index, Iceland, Marksand Spencer and Topps Tiles. We have also conducted work for a couple of centres who wanted to profile their visitors and their opinions of the services provided. A major high street store wanted to conduct some research into their mens, ladieswear and lingerie. They commissioned extensive qualitative and quantitative research to do this. Workshops with staff and consumers to explore what customers are looking for in a quality product versus what those working on the products think is important. Accompanied depth interviews - we accompanied consumers as they shopped for clothes with our client and at competitor stores. We watched how they interacted with the items in store, what displays attracted them and what turned them off. Intercepts and observation - short 10 to 15 minute interviews in store plus observation. Focus groups - we discussed items of clothing provided by our client and items brought along by respondents. Qualitative research with shoppers of a home shopping title aimed at those who have difficulty getting credit. The groups explored their lifestyles, shopping habits, spending and saving habits (if any), how they budget for big occasions like Christmas. We then looked at how the title could better meet their needs. In addition we accompanied their money collectors on their rounds and discussed what they perceive customers need and any improvements to the way they would like to be treated by the home shopping company. This was an ongoing quantitative piece of research which involved exit interviews with customers across a representative spread of stores. Customers were interviewed for 10 minutes on leaving the store about their shopping experience and the service they had received. Short quantitative face to face interviews were conducted with visitors to a shopping centre to profile them in terms of socio demographics, where they lived, how they travelled to the centre and their opinions of the centre facilities. In addition to the above we have also conducted branding research, product research; research into catalogues (layout, content, covers etc) and advertising research in the retail sector. "Despite DJS being based far away from the survey site we received a high quality service that met our objectives exactly"
"We were very pleased with the way the survey was conducted, it was done in a very professional manner and we felt that the staff cared about what they were doing and were genuinely interested in the future of the company."